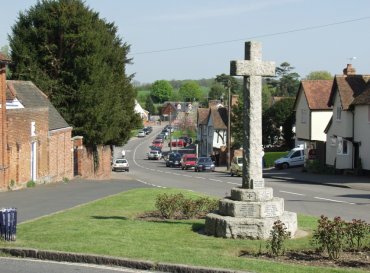 Great Bardfield was at one time a small market town but is now a village. It still, however, retains some of the trappings of its original status, for example, a 'Town Hall'. Many of the timber-framed houses in the village date from the 14th and 15th centuries. 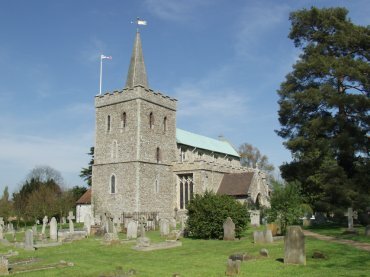 The church of St. Mary the Virgin, Great Bardfield. This church, like it's namesake in Stebbing, is famous for it's medieval stone rood screen between the nave and chancel. 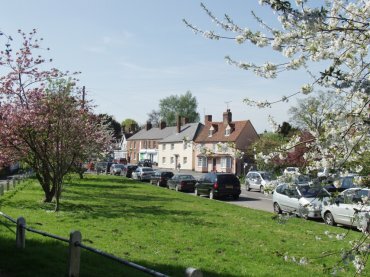 The church can be found next to the Braintree Road. The upper part of Brook Street seen from High Street. During the 1950s Great Bardfield was known as the Artists' Village - Edward Bawden, John Aldridge, Michael Rothenstein and others were among the many artists and designers who were inspired enough by the beauty of the surroundings to live and work here. 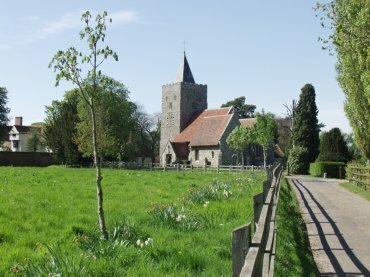 The church of St. Katherine, Little Bardfield. Little Bardfield lies abount one and a half miles west of Great Bardfield and most of this church dates from 1042 and it is famous for it's massive saxon tower. It is a lovely little church although the interior was plain and simple.